One of the current focuses regarding Artificial Intelligence is on ethics. For example, on 8 April 2019 the European Commission published its Communication Building Trust in Human-Centric Artificial Intelligence. Google, despite set backs, also tries to implement an AI ethics board (Kelsey Piper, “Exclusive: Google cancels AI ethics board in response to outcry“, Vox, 4 April 2019). However, ethics cannot be detached from the reality and practicality of AI. Both must feed into each other. Therefore, we need to look at the way AI is or will be very concretely used, beyond an ill-defined “black box AI”. We need to understand its drivers. We need to understand the stakes (Artificial Intelligence – Forces, Drivers and Stakes). And we need to assess the impacts AI will have on governance, management, security and international relations. In this article, we focus upon the way various actors include AI in farming and thus envision and develop the future of agriculture, indeed what is called “smart agriculture”. We then assess major impacts and consequences. We look at the best way to develop and integrate AI into real life activities. Meanwhile, we assess the impact of smart agriculture not only on agriculture security, but also on governance and geopolitics. This is the second part of our article exploring the way artificial intelligence is inserted within its environment through the Internet of Things in a particular domain, agriculture (see first part). This two-parts text belongs to the series focusing on the interface between artificial intelligence and its environment, as well as related impacts on society, politics and geopolitics (“Inserting Artificial Intelligence in Reality“). It dives deeper into the twin interface that allows integrating AI in human reality, looking notably for actuators. Content – Published in two parts (see here for the first part). The table of contents becomes interactive only for members. As a brief summary and reminder, in the first part, we looked at the Internet of Things (IoT) as an ecosystem within which AI-agents may find and use sensors and actuators and thus become fully operational and thrive. Thus, we first explained what is the IoT and why it is a favorable ecosystem for AI-agents. Second, we started the case study on “smart agriculture” aka the Internet of Food. We explained what is smart agriculture and how it is an answer to the challenges of current and future food security. Now, with the second part of the article we look at how companies, from giant ones to start-ups and projects, including smart urban agriculture and a brief first assessment of China’s smart farming, insert AI-agents in the real world. 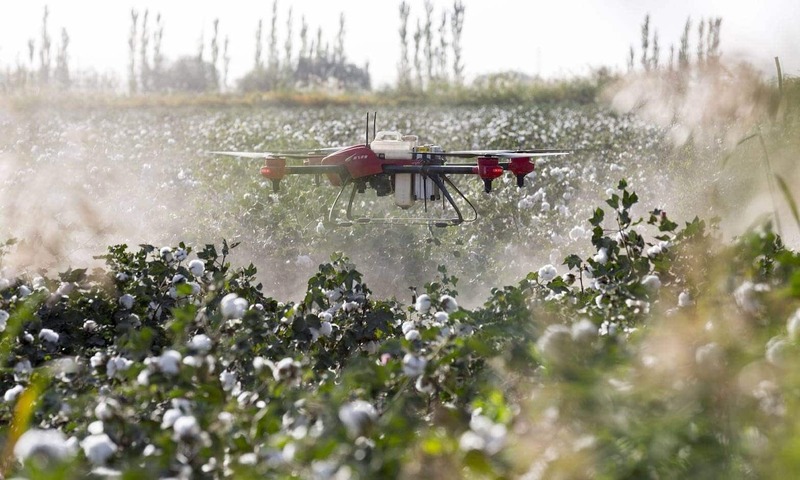 We notably highlight “John Deere FarmForward 2.0 – Revolutionizing agriculture, one plant at a time”, which goes way beyond what the usual giant actors of the digital world, such as the U.S. GAFAM promote. Finally, we turn to the impacts and consequences of smart farming. We find first that, considering the stage of development of AI, those actors that are currently crucial to see a further implementation of AI are not the giant digital companies, but those offering a real operationalisation of AI in the physical world. We then highlight how new beholders of data and thus related knowledge could impact the power of traditional actors. Third, we look at the new security needs of agriculture, including within the context of climate change, and how this potentially will increasingly impact international relations and geopolitics. This is a premium article. To access this article, you must become one of our members. Log in if you are a member. A pdf version of the article is available for members. Featured image: viya0414 via Pixabay, Public Domain. BBC News, “Climate change: Global impacts ‘accelerating’ – WMO“, 29 March 2019. Lavoix, Helene, The Chronicles of Everstate, notably “Rising Discontent” and “Seeking Security” The Red (Team) Analysis Society, 2012. Lavoix, Helene, “Artificial Intelligence, Computing Power and Geopolitics – 2“,The Red (Team) Analysis Society, 25 June 2018. Mello Ulisses, and Sriram Raghavan, “Bringing the power of Watson to farmers“, IBM Blog, 24 September 2018. MunichRe, “HSB’s farm cyber insurance protects the modern farm“. Nafeez, Ahmed, “Dramatic decline in industrial agriculture could herald ‘peak food’“, The Guardian, 19 December 2013. Nakashima, Ellen, “British spy agency delivers scathing assessment of security risks posed by Huawei to U.K. telecom networks“,The Washington Post, 28 March 2019. Sennaar, Kumba, “AI in Agriculture – Present Applications and Impact“, Emerj, 18 February 2019. Shubo Liu, Liqing Guo, Heather Webb, Xiao Yao, Xiao Chang. “Internet of Things Monitoring System of Modern Eco-agriculture Based on Cloud Computing“. 2169-3536 (c) 2018 IEEE, DOI 10.1109/ACCESS.2019.2903720, IEEE Access. Taylor, Charles, Alternative world scenarios for a new order of nations, US Army War College, 1993. UK Cabinet Office and National security and intelligence, “Huawei cyber security evaluation centre oversight board: annual report 2019“. 28 March 2019. U.S. 2018 Public-Private Analytic Exchange Program, Threats to Precision Agriculture, Oct 2018. Valantin, Jean-Michel, Of Fire and Storm – Climate Change, the “Unseen” Risk for the U.S. Economy – State of Play, The Red (Team) Analysis Society, 22 October 2018.